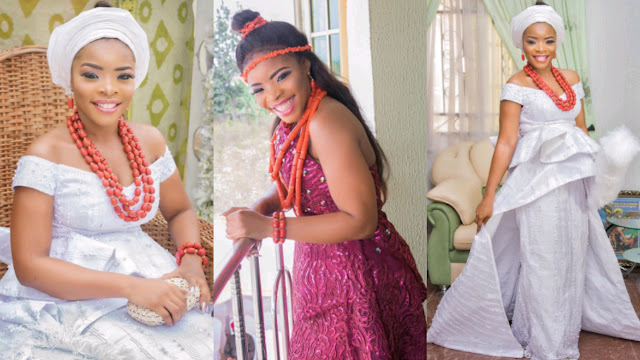 Blogger, Linda Ikeji's younger sister, Laura Ikeji who got married to Ogbonna Kanu two months ago has revealed that none of her friends knew she was dating or getting married. "I couldn't wait to get everything over with. Just wanted a quiet time with my man. None of my friends knew I was dating let alone ready to get hitched! Lol. I didn't think I was ready myself, lol. But look at me now. I'm having fun With me???? Nothing has changed. Same friends, same hangout spots, same clothes but a lil bigger, lol, same team, same hustle. That's basically what you get when you marry your nicca lol. Nothing changes. The devil you know 😂😂😂😂"
» Popular Nigerian Editor, Chris Joseph Says That Laura Ikeji Forced Her Engagement On Poor Ogbonna ? ?